I own a rusty '71 Fastback that I have been toying around with different ideas for for a bunch of years and was never really happy with any of them. Then I found this forum and started noodling around ideas for my old '70 Vert and will still build that fenderless VolksRod. But I still didn't know what to do with the Fsatback. So I was e-mailiong back and forth with my bud Brian (1slo3) yesterday and had a moment of inspiration....influenced heavily by this forum and the ideas and cars flying around here all the time. So, here is a my quick sketch of that "moment" that I had yesterday. Am also working on a 3/4 rearview with all the details. Maybe some pinstripe flames or old school scallops. Last edited by jaransonT3; February 23rd, 2008 at 07:02 PM. Reason: Made some progress today! it almost looks like you could remove the roof and turn it 180* and almost get the needed contour. Sweet rendering....what about 53 Buick side trim?..like a 49-51 merc leadslead I always wanted to see a type 3 with that on it. Member Since Day Two, 2002! Thanks! I actually originally drew with some 57 Chevy 150 style side trim on it. Decided ultimately to keep it simple and smooth. I used to think I knew how to draw. If I was going to all that trouble,I think I would lay the windshield back a little. It sort of has the same lines in profile, but when you see the 3/4 rear view, you will see that I am going for a more squared up look for the cross-car roofline. The Ghia roof is a little too rounded for the look I am after and a first look at it in Photoshop I think it is too small. I am working on the 3/4 view tonight. and the sail panels are not heavy enough,visually, for this look. and rounded the transition into the roof. And played with the tail lights and rear wheel opening. Thought I would throw my "as drawn and scanned" picture of the 3/4 rear view up here. Sort of a before and after....of course the aer will take a little longer. Anyway, you can see what I mean about the side glass being a bit stiffer and squared up than the Ghia roof would allow. If you're looking for a donor for that stainless roof trim, you might look into either '56 or '60-'61 Ford items. Hmmm... what about a second-gen Corvair roof? 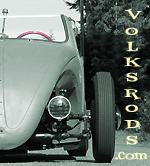 Couldnt get to sleep tonight so I went ahead and finished my rendering of the Type 3 VolksRod. Actually I had just finished the cartoon of the 1960 Ford Starliner that is in my Gallery before coming up with this concept, so the stainless trim along the roof and the overall roofline was influenced by that vehicle. Would have to be scaled down a bunch to fit the shortened roof of the Type 3 though. I actually was going for the "cab-forward" look of the late 50s/early 60s rooflines. They tend to have a more vertical windshield with long sloping rear glass and roof lines. I think that laying back the windshield gives it a more modern look. I am going to consider some other taillights. Maybe a pair of caddy bullets on each side stacked vertical. One of the avatars on this forum has a ghia fender like this. Man, when I saw that first sketch, I thought someone added a ghia roof to my Roadster, and chopped the windsheild. [img]style_emoticons/<#EMO_DIR#>/wacko.gif[/img] I like the look John, [img]style_emoticons/<#EMO_DIR#>/licklips.gif[/img] it'll take some heavy duty measuring before breaking out the sawzall. [img]style_emoticons/<#EMO_DIR#>/biggrin.gif[/img] I think you're largest amount of work will be re-contouring the rear deck lid. You might want to look into going with a Notch lid, as it lays a little flatter, and might follow the contour better. This is how I did my Roadster, and it worked out sweet. I think I can just use the stock decklid and lay it down a bit flatter. It will make the back wall of the decklid slop foward more which will exaggerate the "fins" a little and move the hinge line forward and down. <div class='quotetop'>QUOTE</div><div class='quotemain'> [img]style_emoticons/<#EMO_DIR#>/cool.gif[/img] If you're going with the stock roof, you'll have to shorten it up some to get the porportions right. If I had a bigger pic of my Roadster, you might be able to work out how much you want to lay the "C" posts down in back. I think the roof is going to end up being a custom fabbed thing around what ever glass I find to use for the rear window. I need to get out and do some measuring and then start checking cars in parking lots for something appropriate. Then go find it in a junkyard or new. I am considering making it a fairweather car, but not doing side glass. Just smooth it all out and go with hardtop doors (no frames). Maybe make some snap-in vinyl side curtains incase I run into rain on the way to a show or something. What do you all think? ahh, so you were the one Brian and I were noodling around ideas for. He wouldn't let the cat out of the bag. Played around some different colors and combinations tonight. <div class='quotetop'>QUOTE</div><div class='quotemain'>Brian and I have kicking around the idea of me turning my Roadster into a t-3 heb, since I've already got a folding top mechanism here. Yeah, the "fins" will require some creative metal work, but if you've got some old rusty rear t-3 fenders laying around, then you can use them for some of the shapes you need. This was how I did the inside of my rear fenders, as I had some laying around. They look more like a Notch now. I could have extended them easily, or even frenched the tail lights on them, but that wasn't in my original plans.